The past two decades have seen increasing numbers of women elected to legislative assemblies across Latin America. Such inroads into these previously predominantly male institutions are primarily attributed to the widespread adoption and implementation of well-designed gender quotas. Yet women’s major progress on the legislative front belies their ongoing struggle to attain genuine political influence throughout the region. Concrete, glass, and cash ceilings continue to restrict women’s empowerment. In short, concrete ceilings refer to pervasive cultural perceptions about women’s inability to run for office, and effectively exercise political power. Glass ceilings refer to limitations on women’s ability to ascend party ranks, and to cultivate their own political careers. Lastly, cash ceilings are the financial barriers women face as they are largely excluded from access to money and the financial networks necessary to be a power player. In Women, Politics, and Democracy in Latin America, Tomáš Došek, Flavia Freidenberg, Mariana Caminotti, and Betilde Muñoz-Pogossian bring together a diverse group of academics, practitioners, and activists to discuss the critical challenges women face, and to identify best practices for surmounting the entrenched obstacles to women’s advancement in the political sphere. This well-curated volume first tackles the issue of women’s descriptive representation – that is, the number of women in national legislatures. Leading experts from the United States and Latin America explain that the adoption of gender quotas has resulted in major gains for women in politics, but they caution that this still falls short of equal representation. In doing so they elucidate the formal and informal limitations imposed on women, and recommend strategies beyond gender quotas for promoting women within the political system. Moving toward equal numerical representation requires securing equal access to financial resources, combating violence against women politicians, making parliaments more gender-sensitive, and dismantling the entrenched patriarchal culture characterising political parties. Practical strategies for accomplishing these goals range from establishing parliamentary women’s caucuses and organising special orientation sessions for newly-elected women, to implementing laws that punish political harassment and political violence against women, and developing finance initiatives that earmark funds to improve women’s political representation. The authors’ ability to identify tangible policy strategies for overcoming obstacles to women’s influence represents one of the major contributions of this volume. The second section of the volume addresses challenges and solutions for women’s substantive representation, substantive representation being progressive policy change for women arising from an increased number of women in a parliament. The research highlighted in these chapters reveals that women’s access to office, and formal institutional change, are insufficient to bring about policy change. Nonetheless, contributors make clear that policy actors and activists can take advantage of opportunities presented through both formal and informal political structures to advance women’s rights. Whereas state actors can wield their political influence from within government to erode informal institutions that sustain male dominance and to advance formal reforms that make institutions more accessible to women, extra-parliamentary agents can construct advocacy networks between domestic and international actors to agitate for reform. These multi-actor approaches to influencing the legislative agenda are necessary for deepening women’s involvement in political life and promoting gender equality policies. The third section of the volume assesses how women in politics have shaped public opinion and social media. A cross-national analysis of 18 Latin American countries demonstrates that female citizens in Latin America still lag behind men in both their overall levels of political interests and political participation (although women and men turnout to vote at similar rates). A second analysis of presidential Twitter accounts demonstrates that both former President Cristina Fernández de Kirchner of Argentina and former President Dilma Rousseff of Brazil downplayed gender policy issues during their presidential campaigns, but addressed these issues more frequently after the campaign season. Further, whereas Fernández de Kirchner primarily used Twitter to send messages to her followers, Rousseff adopted an interactive approach to Twitter, frequently engaging different audiences and accounts with the # and @ symbols and (after campaign season) launching Tweets that requested feedback from her followers. As one of the few studies investigating presidential Tweets in Latin America, this study points to the need for future research on the influence of social media on politics and political communication in Latin America. The final section of the book assesses the past and future role of electoral courts and international organisations in promoting women’s political representation, broadly defined. Outlined here is the formative role of electoral justices in interpreting and enforcing gender quota laws to improve women’s numerical participation and appointment to elite political posts. Also addressed is the way in which international organisations such as the Organisation of American States and the United Nations Development Programme have increased women’s participation as voters, candidates, and within electoral authorities. Contributors in this section advance a gender-sensitive electoral observation methodology and explain how international organisations can promote women via advocacy, training, and organising. Throughout, the book introduces multiple innovative measures and methodologies. Malu A.C. Gatto, for instance, develops an Index of Gender Quota Strength (IGQS) for assessing the effectiveness of gender quota policy design. Yanina Welp and Saskia Ruth utilise a new database of presidential Tweets, and conduct a qualitative analysis of presidents Cristina Fernández de Kirchner’s and Dilma Rousseff’s social media engagement. Betilde Muñoz-Pogossian and Tyler Finn of the Organisation of American States advance a new gender-sensitive electoral observation methodology for evaluating men’s and women’s political engagement across all levels of the electoral process. These novel contributions place the book at the forefront of the nexus between research and practice. Another major contribution of the book is its attention to obstacles that impede women’s power, as well as offering practical suggestions for overcoming present limitations. In particular, prior scholarship has paid scant attention to cash ceilings. This volume not only advances our understanding of women’s limited access to resources, but it also provides practical solutions for addressing this major impediment to women’s political careers. Indeed, an impressive strength of this book is that it responds to systematic academic research and on-the-ground observations of women’s limited access to power with policy recommendations for activists and practitioners. Too frequently, academics stop short of identifying practical next steps. Yet, the editors and contributors place policy solutions at the forefront of the discussion in this volume. In doing so, they respond to growing calls for academics and practitioners to bridge the gap between scholarship and policy, and provide a blueprint for cultivating research-based policy solutions. 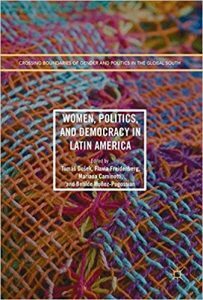 In conclusion, this book leverages rigorous research to develop a series of policy proposals for expanding and deepening women’s involvement in Latin American democracies. The book is accessible to a broad audience including political science students, activists, and practitioners. The editors put academics, activists, and practitioners in direct dialogue with one another to offer a set of institutional tactics for increasing women’s empowerment. As such, Women, Politics, and Democracy in Latin America will serve as a springboard for future research on women’s political empowerment and a resource for cultivating formal and informal strategies for institutionalising women’s access to political power.